These two headliners could not be more distinctly different in their own ways, a smart move by Rooster Walk in my opinion. Give the people variety, praise Jah! The music never stops! 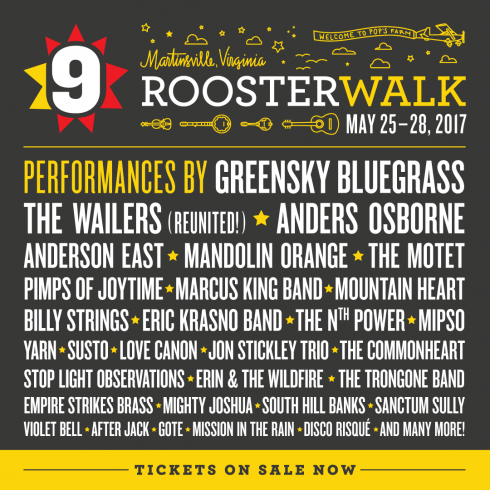 Rooster Walk has done it again, a mixed-bag lineup that makes me think, “Grass and brass!” Bluegrass, Americana, rock and folk groups mixed right in with that NOLA soul, funk, blues and beats. Anders Osborne, Pimps of Joytime, Eric Krasno, The Nth Power, The Motet, and Empire Strikes Brass will be dropping the funk and soul. Hot licks and cool bass lines are on the menu from this impressive list of musicians that are sure to keep things loose during the weekend. Marcus King Band, Anderson East, The Trongone Band round out the rock groups for the weekend. These folks will leave it all out on stage and should not be overlooked!